Is our finned fury about to end up as a fish sarnie? Like, zombie-fried. Tee hee! 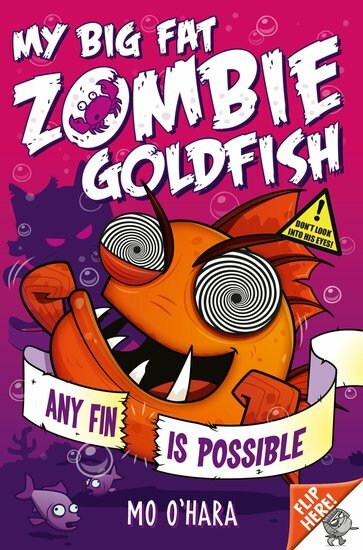 Frankie is not like other fish – or other zombies. After all, normal fish don’t have hypnotic undead powers. And normal zombies don’t swim. Frankie is pretty much all-powerful – but now he’s about to meet some really rotten rivals. (The sort with whiskers, claws and long tails.) The cursed Cat of Kings from Ancient Egypt has been mummified for centuries. Now he’d really like a fried fish sandwich. And prowling just behind is a hungry vampire kitten with a taste for zombie blood. Yup: Frankie’s in hot water!